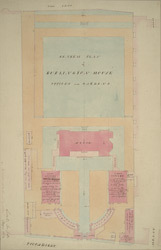 This is a 19th century copy of a plan of the ground plot of Burlington House in Piccadilly. Considered one of the finest examples of palladian architecture in Britain, Burlington House was designed by Sir John Denham between 1664 and 65. James Gibbs added the baroque colonnades in the forecourt in 1714 and 15, while from 1717 to 20 Colin Campbell remodelled the house in palladian style, adding the stone gateway for the Piccadilly entrance and the saloon. Samuel Ware, the architect who produced this drawing, was employed by George Cavendish in 1815 to add the grand staircase and make other internal alterations.